Looking for better sleep? Most people are. These days many only dream of waking up every morning refreshed, and there is a constant search for better rest without sleep medications. Everyone has felt how waking up peacefully after a good night’s rest makes the day go better, but what if the key to that kind of sleep was as simple as light? Research has shown that our sleep quality can be greatly effected by light, so Phillips, in conjunction with independent medical research groups, has created the clinically proven Wake-Up Light. Simulating dusk and dawn, just one of these lights in your room can bring the natural cues of sun up and sun down to whatever schedule you keep. The lamp is UV-free and has LED lights with 20 brightness settings, each tuned by color and tone to mirror natural light. Before you go to bed it will incrementally dim itself to a relaxing glow, and 20 or 40 minutes before the alarm is set to go off it will become brighter with the colors of dawn and start soft nature sounds. The gradual waking effect means that you won’t be jarred awake every morning by a harsh alarm, but gently coaxed to wakefulness by natural cues your body easily recognizes, which can mean an improved mood and energy level throughout the day. 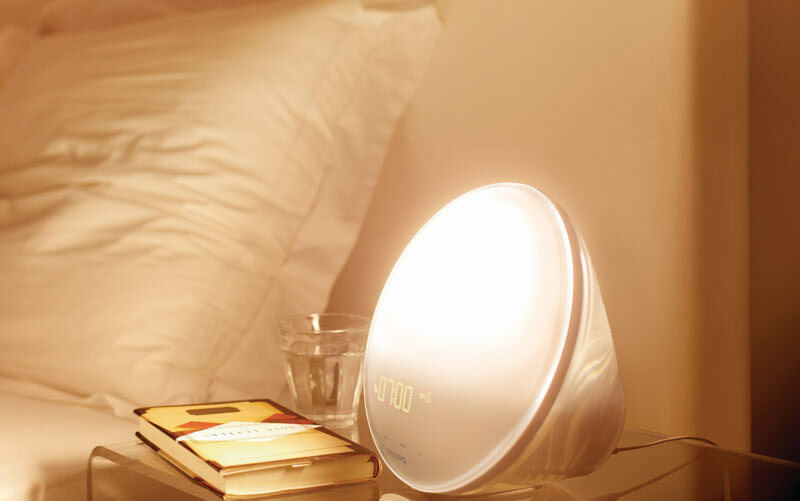 The many brightness settings also make the Wake Up light a convenient bedside reading lamp, and with touch sensitive buttons you won’t find yourself struggling to change times or alarms like on a typical alarm clock. Give your body the chance to follow natural sleeping cues and discover the energy and better mood that come with a great nights rest!